Charitable organizations exist to support and raise funds for a specific group of people. There are numerous charities that support a wide variety of causes such as children in various locations, sufferers of various diseases, homeless people and disadvantaged people at home and overseas. These organizations depend on the generosity of the general community to make donations to charity of money, goods and services, in order that they can carry out their work. Many charities are completely self-funded while others receive some government funding. Throughout history, money has been donated to the needy, as well as food, clothing, tools, bedding etc. These donations were often organized through the Church and it was considered the duty of the wealthier classes and merchants to give to the poor. These days, this generous attitude to giving to the needy is not so well defined. People don’t know how to help or how to make sure their donation goes towards the cause and not just to charity operating expenses. Help other people – there are millions of people in the world who are worse of than we are at any one time. Many of these folk have problems that are not their fault or are beyond their ability to prevent or change. Humans are a social animal and the best way for mankind to advance is by helping those who are unable to help themselves. We have a responsibility to care for other people, to help those less fortunate than ourselves. When we have some spare cash, time or goods, it is an opportunity to help out. Make a difference – donating to charity is the perfect opportunity to make a difference in the world. By making a difference to someone’s life, you are leaving behind a legacy. You are making a statement that your life was worthwhile because you made a contribution to society. Feel good – medical and scientific research has proven beyond doubt that giving to other people makes you feel good. The feeling of satisfaction you get when you help someone else is hard to replicate with any other type of activity or endeavor. People who give feel happier, are less anxious and suffer less depression than those who don’t. Better health is enjoyed by those who donate their time, expertise or money to others who are in need. Charitable people tend to be able to cope with their own problems more easily than those who don’t donate. Giving to others improves your self-esteem, self confidence and self worth. This advantage flows into all areas of your life so you will find that you are more confident at work and in social situations. Support a cause you believe in – different charities touch the heart of different people. If you are passionate about something or believe that a certain area is important, you will be able to support that cause by donating to charity. You might be passionate about every child having access to a good education; that nobody should live in poverty in the 21st century; that everyone should be able to experience music or art. Whatever you believe in or are passionate about, you will be able to further the cause through donations to charity. Meet new people – donations to charity give you the opportunity to met new people and expand your circle of acquaintances. This is especially true when you donate your time or expertise to a worthy cause. While most charitable organizations always need money, many could not operate without an army of volunteers. Whether you give up your time one day a week to serve meals, give a few hours a day to sit with the elderly or travel overseas to help build houses, you will certainly meet many like-minded people along the way. As well as being potential friends, who knows where these new relationships will take you and how these new people might be able to help you in the future? So shed any doubts you have about why donations to charity are so important and offer your time or money to a cause you believe in. Many other people will benefit but you will also benefit in so many ways. So, is giving to charity important in your life? What kinds of things do you do to make a difference for others? Very important to us. We truly believe that supporting local causes in our community will have a trickle down effect that helps everyone in our city/county. I agree. I am personally involved in many local initiatives in a volunteer capacity and it really is great. I am actually helping to make a positive change in the area I live. It is so satisfying and rewarding. I hear Starbucks also does this — they intentionally place Starbucks in location where crime rates are higher. I think it’s commendable. They make sure they pour money into the community where they are located. I think everyone needs to make a concerted effort to volunteer or work at an inner city school. If we don’t things will continue to go downhill. That is a really cool idea. I never knew Starbucks did this. I guess that is one thing that this corporation does that actually helps others. I always bugs me when companies make millions of dollars and never do any good with it. I think your #3 is key. It is interesting to see the science behind it hey?! I always like learning about these kinds of things. Interestingly, I have felt these very benefits myself from donating. It’s awesome. I really hate giving money because I have seen too many “charities” use their funding more for administrative and other questionable uses than for the people it was set up to help. Instead, I prefer giving my time, this way, I know that my donation is being used in a way that I can agree with, while seeing first hand the effects on another person. Good for you- finding a way to donate that you are comfortable with. You are right- there are some charities that have lost balance of operation costs and looking after the cause. I also like to donate my time- I find I learn so much from being involved hands on. I also like the fact that I have a direct impact on people. Nothing beats being able to help someone right then and there, not months down the road when the monetary donations are finally distributed (if ever). Plus I think people should try to make real-life connections rather than just texting in a donation or filling out a form on the web…it’s good for the soul. Ditto to that. I am right with you. I guess that is another reason why I spend a lot of my time volunteering. Great to hear someone else think like me. This is why you should use GuideStar, Charity Navigator, or another third-party group to evaluate the charity that you give to. There is no reason for some “charities” being poorly run for you not to give to those that are well run. All my time really does nothing to fill a hungry belly beyond the one local homeless shelter that we support. My money feeds children on four continents. Charity shouldn’t be an either/or. We should give goods, time, and money. It’s very important to us too. We have a set amount of our budget for charitable giving, and it’s sacred. We personally feel a moral obligation to do this more as we progress in our lives and are happy to be in the position that we are in. We too feel fortunate to be in a position in our lives to be able to help out.. We also make donating a priority and just like you have a set budget amount every month. As our situation changes I am hoping we can donate more and more. We routinely donate clothes and things to charities. 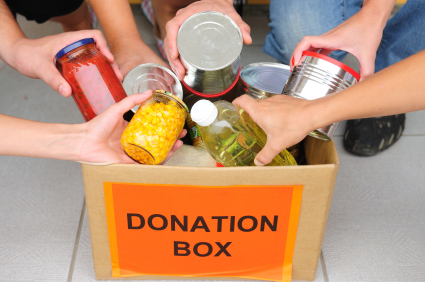 We donate food items and money to charities throughout the year. We do much the same. Every time I declutter and want to get rid of some stuff I always pass it on to those in need. Why not let someone else make use of it. Glad to hear you are doing what you can. I’m more happy to donate to a local soup kitchen than to an established charity that spends a portion of donations for litigation. (Susan Komen sues anyone who uses pink ribbons for collecting money for breast cancer research and they are unapologetic). You are right. Unfortunately many established charities have gotten into a pickle with spending more money on administration than the cause which is not good. There is definitely a need to improve this and regain a better balance. Good work with the soup kitchen. I help out at a teen clinic and I really like it. Giving just makes you feel generoius and great. I think it makes you feel better about yourself to gift. I love it, and hope to be in a position one day to give more than I do today. I appreciate your recent articles on gifitng Miss T.
Thanks Hunter. It is something that is really important to me in my life. I too want to be able to give more in the future. Ideally I want to live a life that contributes to the greater good in different ways. You are right too- giving is such a great feeling. Agreed. I tend to volunteer a lot and I really like all the cool people that I meet doing it. I have made some great friends. Giving to charity is very important. My goal is to be able to increase my level of giving each and every year. Charity is really important in the YFS household. We actually have a 503c non-profit called uplifting sisters 🙂 We sent tons of underprivileged girls to the prom last year. It’s hard work but well worth it. That is so cool. I love that idea. Kudos to you and your family for putting this together. I am glad to hear it has been a success. Keep it up. I feel strongly that we all have a responsibility to help those in need. There are so many ways you can help so there is no excuse. You can volunteer your time to help at a food bank or homeless kitchen. We give to several charities including KIVA. KIVA allows you to directly loan funds to individuals suffering from poverty. It’s a great way to help others out. I have heard of KIVA but haven’t gotten around to really exploring it. I need to make that a priority. I totally agree with you. There are many ways one can help and that we shouldn’t try to find reasons why we can’t. This world would be such a better place if people concentrated on helping others. Glad to hear you make donating a priority in your house. I agree. It really does feel good to know you have helped someone else out at a time they needed it. The more you do it the more you want to do it. It is a great cycle. I donate to charity annually, but mainly in the form of friends asking me for donations for when they Run for Breast Cancer, or for other causes. If no one approaches me (which is rare), I just donate to my favourite causes. We do a combination just like you. We help out friends and family but also do things on our own. Just this month I donated to a local women’s shelter and to a friends Movember campaign. Yes it nice to be rewarded for your good deeds with a tax receipt. I think we should get even more of a tax break though. We are using our money for good causes. Donating is a big way of making you fell good about life. Its like your making up for the bad things the world is inflicting on itself. I donate every month to children at savekids.comuv.com. I find that the dollar I spent made a difference to someone. Recognise people, recognise that we are all human and we need a helping hand, Some more than others. Why charity is important, it is because through this one can make a big difference and also one that can help homeless people and the needy. I do not understand charity giving. I have read through this web site and all of the comments. Our governments take a large slice of our income and what is left over is deemed to be ‘after tax’ money. This money is then given away. Does not make sense. Our government gives billions of dollars away for foreign countries, countries which will have little or no impact on our own population. Countries far away from us and who also think we are total idiots for giving them free money. I think personally that charitable organizations are hosing us. They are taking the easy way out and taking our after tax money. They should be lobbing the government against foreign aid and sucking of the breast of tax payer remittance instead of stealing form the working class. The act of helping others can create an improved sense of well-being. When you give to charity as you are able to help other people, you make a difference in the society, you feel good about yourself, you can support a cause that you believe in and you get to meet new individuals. All religion and saints teach us that charity is the best thing we can do with our money. Helping someone less fortunate is always a good thing. I hope and wish more millionaire come forward and do more charity. I really agree on this piece of information. I was researching for my homework when I saw this essay and it really helps me! I also realize that many parts of this essay make sense. ? I love the idea of donating to charity. Like you said, doing so can really make a difference for society and for those in need. We don’t have a ton of extra money, but I still think we can make some donations. As, a non profit organization we know how important donation is. Donations not only enable us to make a difference in many lives but help us reduce poverty from society by providing quality education to those children’s who can’t afford. Donations enable us to provide healthcare facility to poor people so they can enjoy their lives. Donation is always good. The more you donate the more it changes other lives.